Throwing a Halloween bash? Make sure it’s a dog-friendly Halloween party too! After all, why should the kids have all the fun? We’re getting excited to celebrate Halloween – here are some great tips and tricks for the most pawsome party ever! Start with a spooky fun theme for your dog-friendly Halloween party. You and your guests will have more fun if everything revolves around a theme. 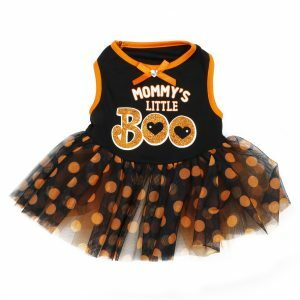 Everything from decor and games to costumes and treats can be tied into an adorable Howl-O-Ween theme. Jack-o-lanterns, ghosts, bats, spider webs, and haunted houses are common themes that work well for all ages. You can send invitations that include the theme, so guests will know what to expect. Let your party decorations, games, and refreshments reflect the theme too. Start with a spooky fun theme for your dog-friendly Halloween party. What are you and your dog going to be for Halloween? No Halloween party is complete without costumes for pets and their people! This year, we expect that more Americans than ever will dress their furry friends in costumes. Can you guess which costume is the most popular? Pumpkin costumes top the list of most popular pet costumes, with 11% of pets wearing it. 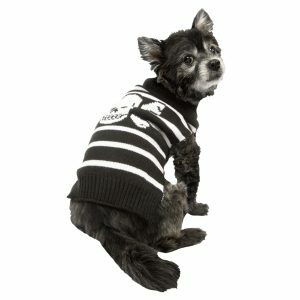 Shop for pet-safe costumes – look for costumes that are as comfortable as they are cute. Or create your own DIY pet costume to suit your own unique pet. Try it on before the big day to be sure it fits and suits your furry friend. Dress up your pooch in style with the colors of the season – orange & black, of course. Pet Factory costumes come in comfortable stretch fabrics that don’t bind. 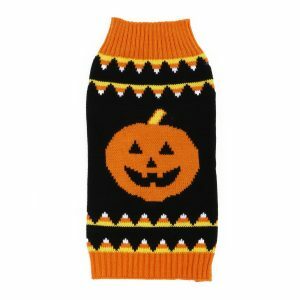 Your dog can sport a skull-and-crossbones or pumpkin-themed sweater for a quick and comfortable costume you can use again and again. Just throw it in the wash after the party and store it with your Halloween decorations, so it’s easy to find again next year. It’s not too early to start decorating for your dog-friendly Halloween party. Set the mood with haunting Halloween décor! Choose from store bought or hand-made decorations to make the holiday come alive. Bring out the old family favorites from years past. Shop for a few new items to freshen things up – get inexpensive banners, lights and table cloths for big impact. Spooky music adds to the overall effect. You can find lots of good Halloween party decorating ideas on Pinterest. Set the mood with haunting Halloween décor and plan a few dog-friendly Halloween party games! You may have party games planned, but how will you entertain your canine guests? Plan a few dog-friendly Halloween party games and they’re sure to have a paw-riffic time! Costume Pawrade – Dogs parade around the yard or neighborhood (weather permitting) to show off their adorable holiday wear. Bobbing for Bones – Dogs take turns retrieving bones in this canine-themed version of the classic Bobbing for Apples game. Hide ‘n Go Treat – Squirrel away squeaky toys in your best hiding spots and watch ‘em go. Costume Chompetition – The dog with the best costume wins a treat. Photo Booth – Snap Polaroid photos of pet guests and Halloween-themed props for fun photo mementoes. Take ‘em home and display on your refrigerator! 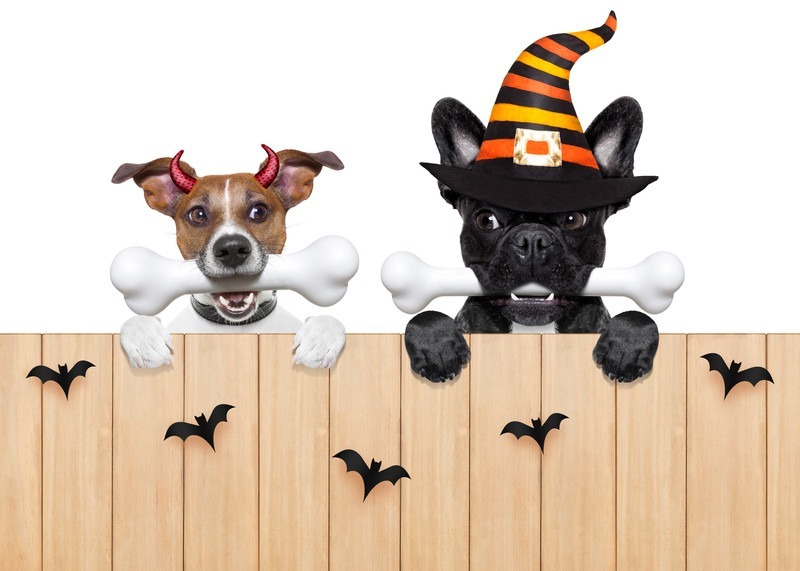 Trick-or-Treat- This is your chance to show off your dog’s best tricks and win a treat! Brew up some spooky fun treats for your people and pet guests! During Halloween fun n’ games, your dog guests will enjoy quick refreshing sips of water, so keep plenty on-hand. 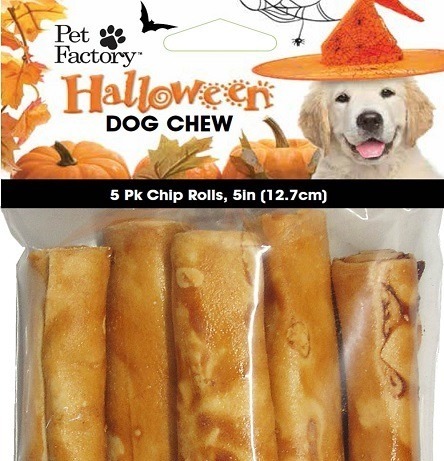 Stock up on treats that dogs can sink their teeth into. Pet Factory all-natural beefhide chews, bones, chip rolls, and braids are long-lasting, yummy treats that satisfy pups. Not only that, but they’re 99% digestible and contain no corn, wheat or soy and are preservative-free. After the party, send your canine guests off with an adorable Halloween-themed doggie bag, complete with a toy and treat. Pet Factory’s Happy Howlidays dog toys and treats are the perfect choice for all dog breeds and sizes. Stock up on Halloween treats that dog guests can sink their teeth into. When you’re combining people and pets with the excitement of Halloween, everyone’s bound to have a blast! Keep in mind a few common-sense safety tips, so your pet guests enjoy this haunting holiday too. Stow glow sticks, plants, candles, and people treats (especially those that contain chocolate) well out of reach of pups. Provide water for pets and people. Have a place for pet guests to take a break from all the excitement. Set boundaries for pets and children. Beware of sensory overload! Pets may enjoy a break from the action. Create a dog-friendly space, free of breakables and harmful items. After the party, offer your pups chew toys and treats to soothe them. If you’re throwing a Halloween bash this year, be sure to invite your furry friends. Your dog-friendly Halloween party will be the best on the block!